You think it is just a small plumbing leak? Well, think again. It’s better to fix it as soon as possible before it gets worse and can cost you more. Small plumbing leaks, if left untreated, can cause major damage to your home, which means more work (and money) for repair. If you are located in Southern California with plumbing issues in your property, our plumbing leak repair San Diego can be a great help to prevent further damage that this plumbing issue could bring. Plumbing leaks can lead to mold. When a plumbing leak is left untreated, it can lead to mold. Molds and mildew exist when there is moisture – how much more if more water is present? Molds do not only ruin the integrity of your walls but can also compromise the health of the dweller/s. Plumbing leaks can damage flooring and fixtures. If water makes it to your flooring, that is another problem that you are going to deal with. Whether your floor is made of wood or concrete materials, it can still be vulnerable to damage brought about by leaking water. Better have it fixed by a plumbing leak repair San Diego before it can cause a damage that is probably beyond ordinary repair. Leaks can increase your water bill. Leaks in your water supply pipe cannot just cause damage to your property but can also increase your water bill. It might be a few dollars increase in a month, but if such leaks are not fixed in a long period of time, it can easily add up and can cost you more. 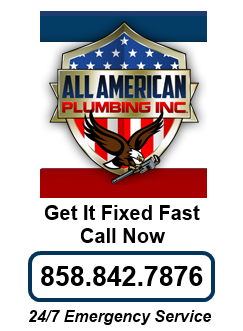 All American Plumbing is trusted by many homeowners in San Diego and surrounding area for their service needs. Not only is the company home to highly-skilled plumbing technicians but it also uses state-of-the-art plumbing equipment in order to give you the service you deserve. If you need a plumbing service, don’t hesitate to contact us at (858) 842-7876.